Attestation of power of attorney is NOT same as registration of power of attorney. Attestation is a pre-requisite to registration, if you are outside India – NRI (non-resident Indian). Attestation of Power of Attorney by Indian Embassy (New York, Washington DC, Houston, San Francisco, Atlanta, Chicago) in USA can be done by post or in-person. Miscellaneous services form. Each Indian embassy their own format: New York, Washington DC, Houston, San Francisco, Atlanta, Chicago . Original Passport + Copies of all non-blank pages including first and last page. 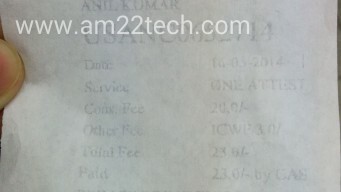 Copy of Address proof in USA – 1 address proof is required. It could be bank statement, driving license, utility bill, Home lease agreement etc. Valid Visa copy – H1, H4, L1 etc – Remember B1/B2 is not considered valid for creating POA. Original Visa petition approval notice i797 or proof of pending extension. Original i94 + Copies – In case of electronic i94, just take the print-out with you. 2 passport size photograph to be affixed against your name on POA. NOTE: It is advised to carry the original version of the documents with you for verification, in case consulate asks for it. The process of registering the POA does NOT require ‘attestation‘ if you are still in India and planning to leave soon. i.e. you are about to leave and want to give power of attorney to someone in your family or a friend. 2 witness signatures are required for attestation of Power of attorney. Witness can be anyone holding a valid US ID proof with an address and photo. Witness should preferably be other than immediate family members. Witnesses CAN go to Indian Consulate with you? There is NO need to get the notarization. Witnesses CANNOT go to Indian Consulate with you? Take signatures of 2 witnesses on this POA in the presence of Notary. Free notary is available in most town’s library, banks like Bank of America (Free if you have an account with them) and your own office would have one. Paid notaries are available at USPS offices/shops too. You should NOT sign the POA yet. It is to be done in front of Indian consulate. If the notary insists on your sign, then you can sign. You will be required to sign once again in Indian Embassy. You may or may not need Apostile based on your current Passport and the Indian Embassy you are applying at. If you need Apostile, check US secretary of state office website for Apostile process. Supporting documents do not need Apostile. You should either have 2 witness travel with you to embassy or have the notarized POA. Each embassy office has time window normally between 9 AM to 11 AM to accept in person attestation requests. If both you and your spouse have been named as executant in POA, then both of you need to be present in Embassy physically with your original passports. Your original POA, a photocopy and original passport would be taken up by the consulate officer after making you sign in front of him. Deposit the fees and you will most probably be asked to come back after 12 PM (afternoon) to collect the attested PoA. Show the receipt and collect the attested POA and your passport. You are all set. You need to get all the signatures (2 witness + your own) notarized. Get the fees cashier check or money order. The return shipping check has to be made separately. The amount differs by each embassy. No need to send the return shipping envelope. They take care of it with the return shipping fees that you send. Send the documentary proof (only photocopies) with an exception of original passport to the Indian consulate. The consulate will attest and return the documents back to you within a week. Registration of ‘attested POA’ can only be done in India. Send PoA to India and then follow steps to register this POA. 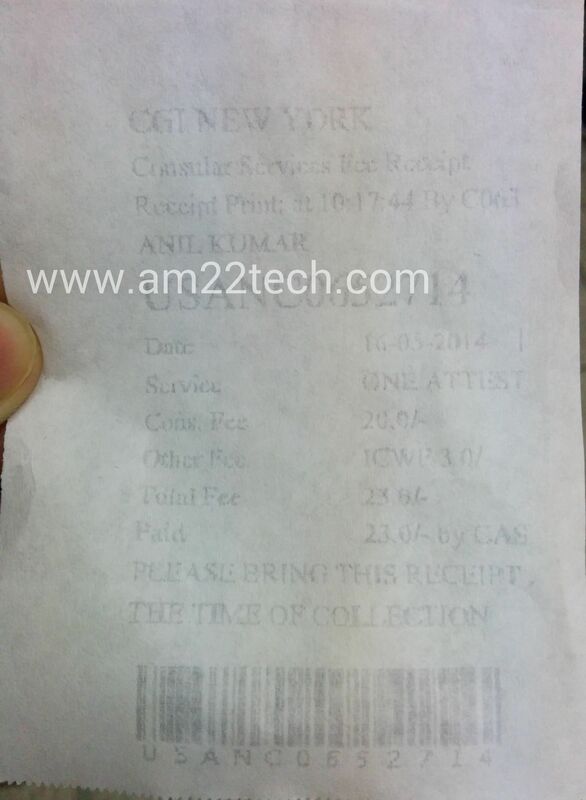 New York Indian Embassy charged us fees per document instead of per page (2 executants with 1 page of POA): fees $23. People have reported that Indian Embassy at Washington charges the fees per signature and per page attestation. Leave Blank Apace on Top of POA Page? We do not think any blank space on top of the POA page is required. Use General or Special PoA for Purchasing Flat in India? Normally, the developer/builder would require a special power of attorney for the property dealings specifically meant to serve that particular property/flat. You can confirm from the developer before-hand or to be on a safer side, create a special power of attorney. Embossing is part of Notarization process in USA creating raised relief images and designs in the paper to make the original copy tamper proof. Embossing is not required. Use ONLY Notarized POA in India? It depends on the third party like a bank or builder who needs this POA to make a decision on what level of attestation is needed. Indian banks like SBI, ICICI, HDFC accept notarized POA in USA to get home loan without Indian Embassy attestation. So, the best option is to ask the end user of the POA about the requirements. Hi Anil, I am US citizen with Indian origin with OCI. I am selling a plot in India. We have a buyer. I am planing on giving SPA to my uncle. The buyer/agent are ok with it. They sent me SPA agreement as well as the Sale Deed – As per their instructions, I need to sign every page of both documents, add a picture, have two witnesses signed and attested by Indian consulate. I am in NYC and planning to go in person. I see majority of the discussion here is about POA. Can you please throw some light on the actual Sale Deed. Do we need to go through the same process (sign every page, witness signatures, consulate attestation)? Really appreciate your help. Yes, the process is same for attestation by Indian embassy. Thanks Anil. I was clear about the witness signatures on the SPA. I was not sure if the witness attestation listed on the sale deed whether they are witnesses in US or witnesses in India when the actual registration happens. Thanks again. Witness in USA are for your signature attestation. The two witness would again be required in India for property registration. My son, (US citizen) gave POA to his friend to sell a piece of land in Indore MP to his friend. It was duly notarized and apostilled as you suggest but we did not register it. Should it be registed in Indore registry? As per my information, POA should be registered for buying or selling property. 1- Do you suggest to create GPA for both of us (husband and wife) again from SFO as mine was created in india? 2- If yes, can it be a one GPA with both the names or separate ? 3- Do we need to glue the photo for all of us (3) or just of my brother. The GPA format which is given to me has the space for attorney photo but not for the executer. 4- Do we need to take the signature of my wife along with the 2 witness in front of notary or just the 2 witness before sending it to appostile. 5- signature space will be left blank for attorney as my brother is in india ? 6 – do we need to attest all the pages in indian consulate? sorry for lot of questions. thanks for helping in this matter. I request you to please read the article. It has all the answers. I need an affidavit from my sister from USA. They are going to notarize it in USA. I want to know if they need to emboss it in USA Indian embassy. Need an affidavit only, there is no need for POA. We need affidavit for india use. Indian embassy attestation is needed or not is dependent on the purpose in India. If the organization who is going to use it in India is okay with only the notarized affidavit, then you can use it. SF embassy website has changed from http://www.cgisf.org to https://www.cgisf.gov.in , just in case you want to update the hyperlinks. Thanks for the information. I will update the links. I am planning to send all documents related to POA to Atlanta Indian consulate through post. Can anyone please let me know whether they have faced any situation like delay from consulate in sending your documents back? My POA is 3 pages, should i sign on each paper? and should i pay fees for each page? It is recommended to sign on each page and pay fees per page. I had answered similar questions for Atlanta embassy POA by mail here. Yes, notarization is required for documents. We encourage receiving the Applications through post. Applications received through post will be serviced in 3-5 business days. If you read the article above, I have given the link to checking Apostile requirement for each Indian embassy. Please use it and you will now if you need it or not. Thanks, according to the link if I show up in person (Houston) there is no Apostille requirement! Not sure if that is correct since you have mentioned it is not necessary to send return envelope. Also it is not mentioned on their website how much is the return shipping. Would you know how much is to be paid for return shipping. Each Indian Embassy’s requirements are different. If NY embassy website says that send a return envelope, then you should send return envelope with shipping label already pasted on it. I am sending all documentation by mail to NY Consulate. Would you know if i need to send the Green Card original or just a notarized photocopy will suffice? Only Indian Passport is needed in original. All other documents should just be a notarized copy. I need your urgent input and help. We have mailed out the package but we forgot to enclose the money order for $22. What should we do now. Anyway if we can send out the money order separately or if someone has been through this experience. Panicking a little so any advise will be deeply appreciated. You can probably call Indian embassy and ask for the help. They can probably connect your application package with the money order mail that you send separately. ok thank you. I just saw on their website they have a PRAMIT online query system. Let me try there. I am a US citizen with an Indian OCI card. I have gotten my POA document Notarized & Apostilled. I will be sending it to the Indian Embassy in Chicago to get it Attested. I have also gotten photocopies of supporting docs (e.g. my US Passport, OCI card, PAN card, Witness’ Passport copy etc) notarized. But these photocopies are not Apostilled (only Notarized). The question I have is if these photocopies should also be Apostilled? Do they apostille photocopies? And do these photocopies also need to be “Attested” by the embassy? Or is Attestation of the POA doc alone sufficient? Thanks. Supporting documents photocopy do not need Apostile or Attestation. Only notary is required. Indian embassy will only attest Power of Attorney. Thank you so much for your response. And thanks for providing this great information to all. Reg my POA doc – it’s a 5 page doc, should I get every page attested by Indian Embassy? Or just the last page? Not sure how that works? Thanks. It is your choice if you want all pages signed and stamped by Indian embassy or just the last one. They will ask you. My suggestion is to get sign and stamp on all pages to avoid any fraud later. Thank you. That’s what I’ll do. Thanks for all your help. Am American citizen now. Can the power of attorney I give, be attested by the Indian embassy? Yes, Indian embassy can attest any document if it is intended to be used in India. Does not matter if you have US passport or Indian.